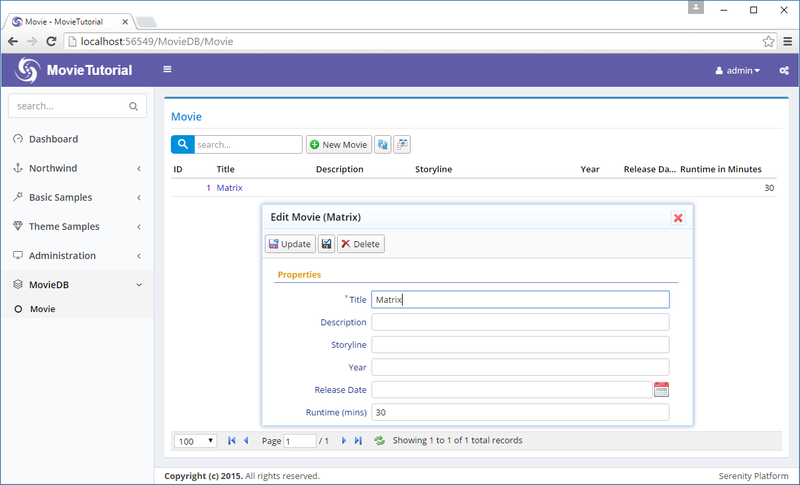 In our movie grid and form, we have a field named Runtime. This field expects an integer number in minutes, but in its title there is no sign of this. Let&apos;s change its title to Runtime (mins). There are several ways to do this. Our options include server side form definition, server side columns definition, from script grid code etc. But let&apos;s make this change in the central location, the entity itself, so its title changes everywhere. 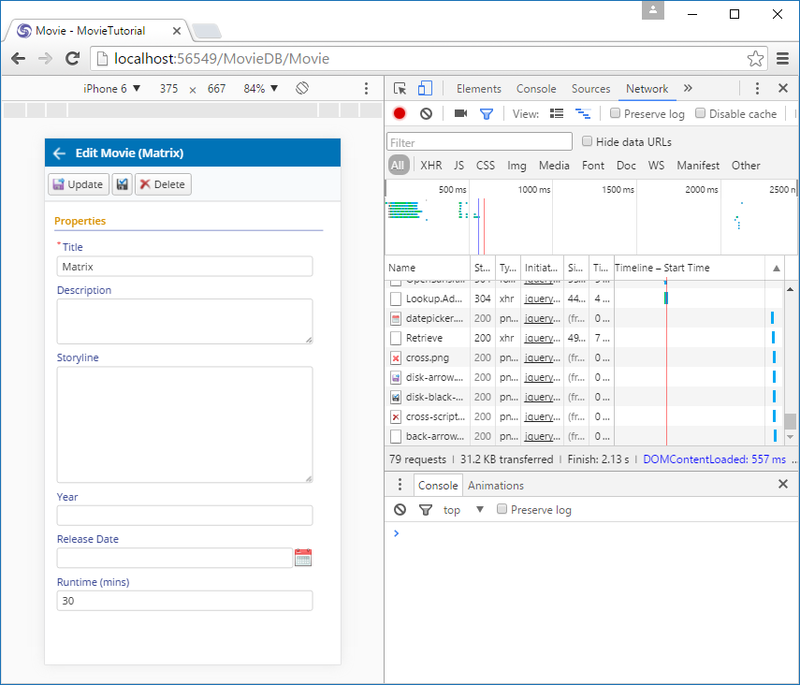 When Sergen generated code for Movie table, it created a entity class named MovieRow. You can find it at Modules/MovieDB/Movie/MovieRow.cs. Now build solution and run application. You&apos;ll see that field title is changed in both grid and dialog. Column title has "..." in it as column is not wide enough, though its hint shows the full title. We&apos;ll see how to handle this soon. 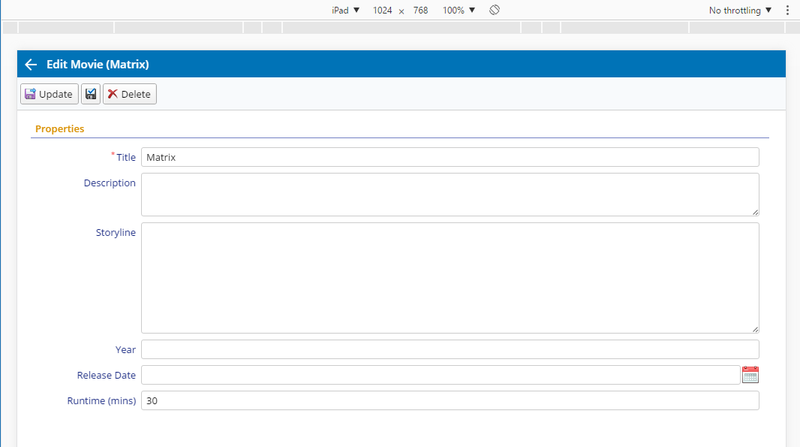 So far so good, what if we wanted to show another title in grid (columns) or dialog (form). We can override it corresponding definition file. You may notice that this columns definition is based on the Movie entity (BasedOnRow attribute). Any attribute written here will override attributes defined in the entity class. Now we set column caption to "Runtime in Minutes". We actually added two more attributes. One to override column width to 150px. Serenity applies an automatic width to columns based on field type and character length, unless you set the width explicitly. And another one to align column to right (AlignCenter, AlignLeft is also available). Form field title stayed same, while column title changed. Description and Storyline fields can be a bit longer compared to Title field, so lets change their editor types to a textarea. 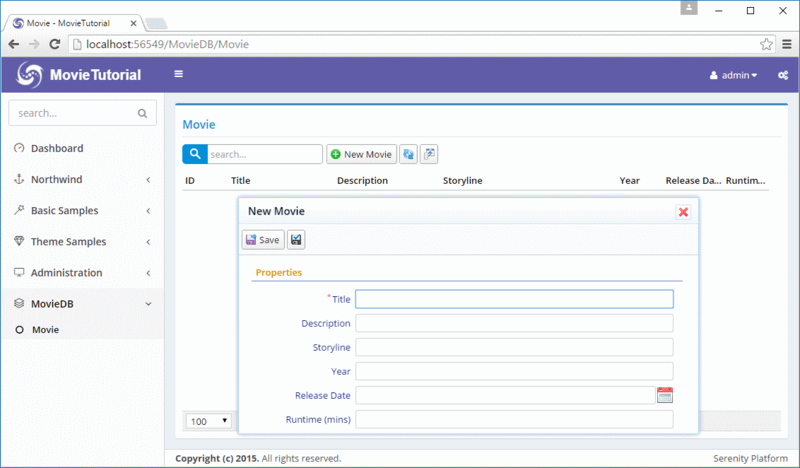 Open MovieForm.cs in the same folder with MovieColumns.cs and MovieRow.cs. I left more editing rows for Storyline (8) compared to Description (3) as Storyline should be much longer. Serene has several editor types to choose from. Some are automatically picked based on field data type, while you need to explicitly set others. You can also develop your own editor types. You can take existing editor types as base classes, or develop your own from stratch. We&apos;ll see how in following chapters. As editors became a bit higher, form height exceeded the default Serenity form height (which is about 260px) and now we have a vertical scroll bar. Let&apos;s remove it. Sergen generated some CSS for our movie dialog in MovieTutorial.Web/Content/site/site.moviedb.less file (in Visual Studio it may appear as a child of site.less if you have file nesting enabled). 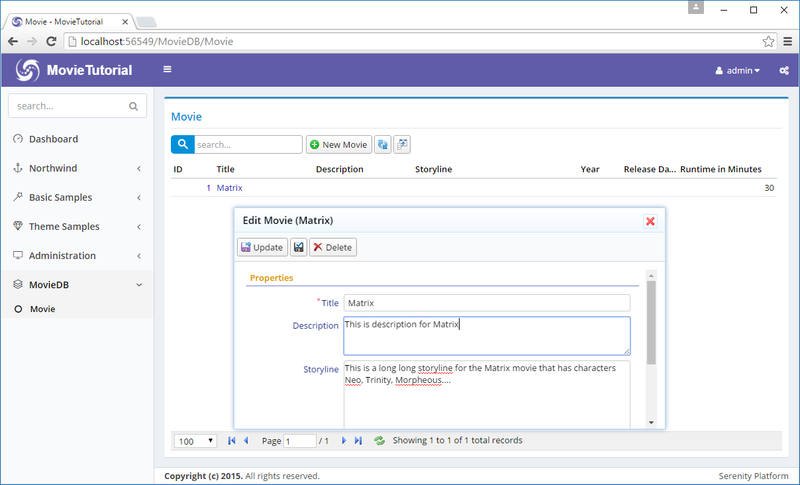 These rules are applied to elements with .s-MovieDB-MovieDialog class. Our Movie dialog has this class by default, which is generated by "s-" + ModuleName + "-" + ClassName. The second line of this style class specifies that this dialog is 650px wide by default. The third line specifies that field labels should be 150px (@l: 150px). For this change to be applied to your dialog, you need to build solution. As the "site. *.less" files are compiled to a "site.css" file on build. Now build and refresh the page. So, the height we set here is only meaningfull for desktop mode. Dialog will turn into a responsive, device size specific mode in mobile, without having to mess with CSS @media queries. Our page has title of Movie. Let&apos;s change it to Movies. Change DisplayName attribute value to Movies. This is the name that is used when this table is referenced, and it is usually a plural name. This attribute is used for determining default page title. 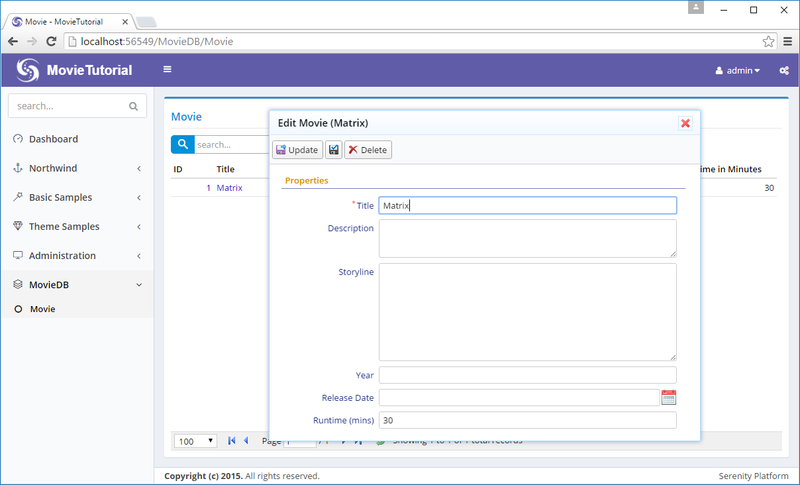 It is also possible to override the page title in MoviePage.Index.cshtml file but as before, we prefer to do it from a central location so that this information can be reused in other places. InstanceName corresponds to singular name and is used in New Record (New Movie) button of the grid and also determines the dialog title (e.g. Edit Movie).